Dudu Tucci was born in Sao Paulo in 1955. He was born into a musical family and started drumming as a young boy in the Umbanda ceremonies. After leaving school he studied percussion, flute and musicology. From 1976 he travelled extensively throughout Latin America where he discovered diverse ethnic music traditions with a profound spirituality that has influenced him ever since. Celebrated as an outstanding percussionist, in recent years he has performed at a variety of international festivals, including the 1993 Korean EXPO in Taejon with the Korean Percussion group Samul Nori, in 1994 in Taiwan and at the "Perc Pan" percussion festival in Salvador de Bahia where he performed alongside musicians such as Nana Vasconcelos, Terry Bozio, Glen Velez and Los Papines an in 2000 at the Hannover EXPO. 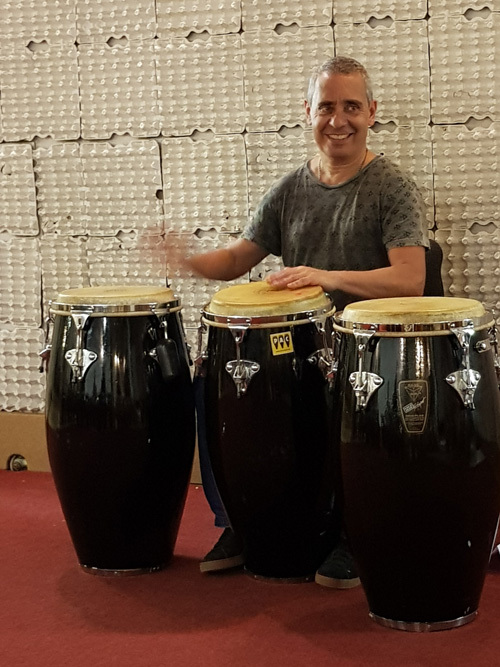 As a much sought after percussion teacher he continues to inspire the many thousands of students who take part in his courses such as Conga Total, Samba Fever, and the professional training project "Roots of Brazil". 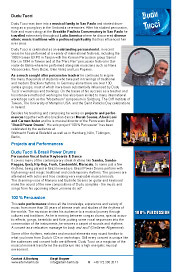 In Germany alone there are over 130 samba groups, most of which have been substantially influenced by Dudu Tucci´s samba workshops . On the bases of his success as a teacher and his intensive method of working he has also been invited to many international workshops such as the "Mozarteum" symposium in Salzburg. The Orff Institute of Taiwan, The University of Memphis U.S.A. and the Saint Patricks Day celebrations in Ireland. Since 1996 he has worked in Great Britain and Ireland on the "Roots of Brazil" percussion project run by One Voice Music. Together with Tiago de Oliveira Dudu Tucci has written "Samba and Sambistas in Brazil", a theoretical study of Samba. He has contributed to various recordings by other artists such as Reinhard Flatischler´s "Megadrums" and has so far released 5 solo CD´s: Odudua, Obatimalé, Orixas, Native Dreamer and Tribal World. His sixth album, to be released shortly, presents Dudu Tucci live with his new band, some of whom he has worked with for many years and who have collaborated with him on earlier studio albums. The first Inaê concert took place at the closing celebrations for the EXPO 2000 in Hannover with great success. Dudu Tucci enthralled the audience with his charismatic presence. For further information please check also Dudu Tucci's Percussion Art Center.